I keep seeing this article in my timeline today about the Raspberry Pi. I thought I'd write up some notes about it. The Raspberry Pi costs $35 for the board, but to achieve a fully functional system, you'll need to add a power supply, storage, and heatsink, which ends up costing around $70 for the full system. At that price range, there are lots of alternatives. For example, you can get a fully function $99 Windows x86 PC, that's just as small and consumes less electrical power. There are a ton of Raspberry Pi competitors, often cheaper with better hardware, such as a Odroid-C2, Rock64, Nano Pi, Orange Pi, and so on. There are also a bunch of "Android TV boxes" running roughly the same hardware for cheaper prices, that you can wipe and reinstall Linux on. You can also acquire Android phones for $40. However, while "better" technically, the alternatives all suffer from the fact that the Raspberry Pi is better supported -- vastly better supported. The ecosystem of ARM products focuses on getting Android to work, and does poorly at getting generic Linux working. 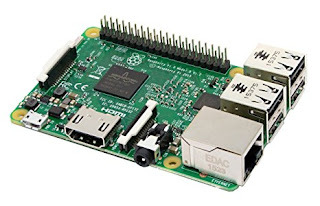 The Raspberry Pi has the worst, most out-of-date hardware, of any of its competitors, but I'm not sure I can wholly recommend any competitor, as they simply don't have the level of support the Raspberry Pi does. The defining feature of the Raspberry Pi isn't that it's a small/cheap computer, but that it's a computer with a bunch of GPIO pins. When you look at the board, it doesn't just have the recognizable HDMI, Ethernet, and USB connectors, but also has 40 raw pins strung out across the top of the board. There's also a couple extra connectors for cameras. The concept wasn't simply that of a generic computer, but a maker device, for robot servos, temperature and weather measurements, cameras for a telescope, controlling christmas light displays, and so on. I think this is underemphasized in the above story. The reason it finds use in the factories is because they have the same sorts of needs for controlling things that maker kids do. A lot of industrial needs can be satisfied by a teenager buying $50 of hardware off Adafruit and writing a few Python scripts. On the other hand, support for industrial uses is nearly non-existant. The reason commercial products cost $1000 is because somebody will answer your phone call, unlike the teenager whose currently out at the movies with their friends. However, with more and more people having experience with the Raspberry Pi, presumably you'll be able to hire generic consultants soon that can maintain these juryrigged solutions. One thing that's interesting is how much that 40 pin GPIO interface has become a standard. There are a ton of competing devices that support that same standard, even with Intel x86 Windows computers. The Raspberry Pi foundation has three boards that support this standard, the RPi Zero, the Model A, and the Model B. Competitors have both smaller, more efficient boards to choose from, as well as larger, more powerful boards. But as I said, nothing is as well supported as Raspberry Pi boards themselves. Raspberry Pi class machines are overpowered for a lot of maker projects. There are competing systems, like the Arduino, ESP32, and Micro:Bit. As a hacker, I love the ESP32 class devices. They come with a full WiFi stack and can be placed anywhere. If you are buying a Raspberry Pi, I recommend Adafruit. Not only do they have the devices cheap ($35), they'll have a lot of support for maker hardware that you may want to add to the device. After buying the board, you have to choose the accessories to get it working. Your first choice will be a power supply. You'll be tempted to use the USB chargers and cables you have lying around the house, and it'll appear to work at first, but will cause CPU throttling problems and file corruption. You need to get either the $8 "official" power supply, or one of those fast charging devices, like those from Anker. Remember that it's not just a matter of the power supply providing enough current/amps, but also cables with 20 AWG wires that can handle the current. Your next choice will be the flash drive for booting the computer. One choice is micro SD cards. You should choose cards with the "A1" rating, which are faster at random file access. Most other microSD cards are optimized for large sequential transfers, and are painfully slow at random accesses. If you write a lot of data to the device, you may need to get a card rated for "endurance" instead -- micro SD cards wear out quickly. Or, you may consider a real SSD connected to the USB port. You can get a $20 120-gig SSD and a $8 USB-to-SATA adapter. This will perform much faster, and not have the data corruption issues that micro SD cards have. You need an independent power supply for the drive, as it can't be powered wholly from the USB port. Your next decision will be a heatsink. The Raspberry Pi generates a lot of heat at full load. People assume ARM is efficient, but it's not, and the Broadcom ARM CPU used by the RPi is very bad. Unless you have a heatsink, instead of running at 1.4-GHz, it'll spend most of it's time throttled back to 600-MHz. Because of their size, your choice of heatsink and fan depends upon your choice of case. There are some nice aluminum cases that act as a heatsink. You can also get combo kits on Amazon.com for $15 that include the case, heatsink, and fan together. If looking at a competing device (e.g. Odroid-C2, Rock64), get one that supports eMMC. It's much faster and more reliable than micro SD cards. For home server applications, its worth getting a lesser supported platform in order to get eMMC. It makes a huge difference. I stopped using Raspberry Pi's for home server applications and went with Odroid-C2 machines instead, mostly because of the eMMC, but also because they have more RAM and faster Ethernet. I may switch to the Rock64 device in the future because of its support for USB 3.0. I have one on-order, but it's taking (so far) more than a month to arrive. As for the ARM ecosystem, there seems to be a lot of misunderstanding about "power efficiency". People keep claiming they are more efficient. They aren't. They consume less power by being slower. Scaled to the same performance, ARM CPUs use the same amount of power as Intel CPUs. Now that ARM has more powerful CPUs close to Intel in speed, and Intel now has their low speed "Atom" processors, we see that indeed they have roughly the same efficiency. The Raspberry Pi's Broadcom CPU is extremely inefficient. It uses the decade old 40nm manufacturing process, which means it consumes a lot of power. Intel's latest Atom processors built on 22nm or 14nm technology consume a lot less power. There are things that impact efficiency, but the least important of which is whether it's ARM or Intel x86, or RISC vs. CISC. For hackers, there's a lot you can do with a Raspberry Pi (or competitor). We are surrounded by things that we can hack. For example, you can use it to hack the CEC feature of HDMI to control your TV. You can attach a cheap RTL-SDR device and monitor radio frequencies. You can connect it to the CAN bus of your car. You can connect it to your ZigBee devices in your home and control your lights. If there's a wire or radio wave around you, it's something you can start hacking with the RPi. A feel the above article does the subject a disservice. It's less "industrial IoT" and more "crossover between maker culture and industry". Every geek should get a Raspberry Pi and play with it, even if it's only as simple as a Owncloud/Nextcloud backup server sitting in a closet. Don't skimp on the power supply, as people who do get frustrated, you need a charger rated for at least 2.4 amps and a charging cable with thicker 20 AWG wires. If going the micro SD route, choose "A1" or "endurance" rated cards. Consider going a USB SSD route instead. Two comments and they are both SPAM! This happens often at this blog Roger. Either Rob seems to think freedom of speech is more important then filtering out trash. Or Rob doesn't read the comments at all.